In 1990, Mindscape released Mad Max for the NES, a mostly disappointing game already expertly reviewed by The J Man. 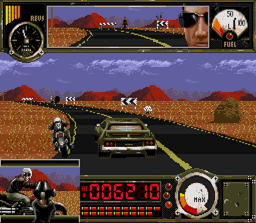 Apparently not shaken by their first sub par offering, Mindscape went back to the well in 1992 for another stab at the Mad Max trilogy, this time on the 16-bit consoles. Thanks to the shockingly sparse amount of online info available, I’m not completely sure what happened next. Maybe Warner Bros. saw the game and didn’t like it. Maybe they just decided it wasn’t the right time for it. Or maybe Mindscape was producing the game on spec, hoping to get Warner Bros.’ permission after the fact. 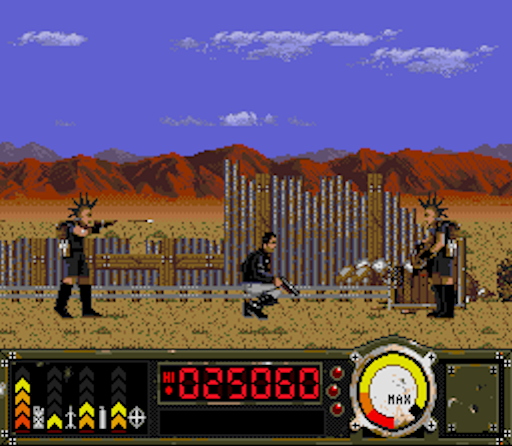 In any case, Mindscape never actually got the legal clearance to use the Mad Max characters, but they’d already spent their lunch money on making the game. No problem. Tweak the graphics, cut anything identifiably stolen, change the title, and voila! You’ve got your own original IP called Outlander. No! I'm not Mel Gibson! I love the Hebrews! And really, Warner Bros. should have just gone ahead and given them the license. At least then they would have gotten some money out of the deal. Because even though the title screen says “Outlander” where it may previously have said “Super Road Warrior”, this is still obviously a Mad Max game. 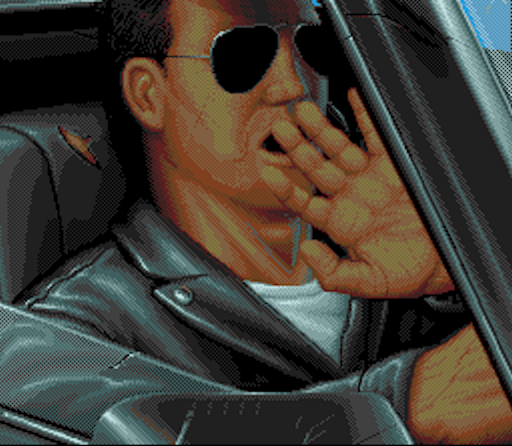 You play as Max — I mean some guy in a leather jacket and sunglasses — whose mission, presumably, is to drive around a lot. You start out in your swanky car, tooling down a generic desert highway that is invocative of, but legally distinct from Australia. You’ve got to deal with road obstacles, biker goons, and gyrocopters (or perhaps just non-copyright-infringing helicopters) as you speed to the nearest town. When you arrive, you’ll hop out of your car, tussle with some bad guys, and replenish your supplies so you can get back on the road and do it all over again. I was unable to track down a manual, which is unfortunate because I would have liked to see if this game had any kind of story apart from what was obviously lifted from the dystopian future of the Mel Gibson flicks. If you’re a fan of the films, feel free to go ahead and pretend that this is an official Mad Max game. In terms of the handling of the license, you won’t be disappointed. As The J Man pointed out in his review of the NES game, Mad Max centers around our dependence on gasoline and how something we take for granted could become incredibly precious if we suddenly ran out. Carrying this theme to the game, Outlander focuses on resource management. Don’t expect to roar down the highway at top speed while firing your machine guns indiscriminately. You’ve got ammo and you’ve got gas. If you run out, you’re screwed. Thankfully, though, not as screwed as in Mindscape’s previous offering. The driving is presented in third person, behind your car, allowing for easy maneuverability. You have a panel showing the dash directly below the main screen, and one showing your rear view mirror (and cocky expressions) directly above. The mirror, of course, gives you the heads up on bikers and copters approaching from behind, though short of running directly into you, your enemies don’t have much in the way of rear attacks. The dashboard houses all of your meters and gauges displaying health, fuel, machine gun ammo, shotgun shells, missiles, nitro for speed boosts, and a fantastically cheesy taxi-like points meter which comes complete with an indicator that lights up when you surpass the high score. That over there in that little box... Yeah in the lower left corner there. That's my BOOM STICK! Your main task is avoidance since hitting things costs a surprising amount of health, but you’ll also have to dispatch plenty of your fellow commuters. Missiles are reserved for copters. Fire one and it will seek the nearest whirlybird. If one is close enough, the missile will hit. If not, you just wasted a missle. The machine guns mounted on your ride are for enemies in front of you, but they’re weak, hard to aim and always seem put you in the perfect position to be nailed by a molotov cocktail. The shotgun on the other hand is a thing of beauty and the most compelling reason to play this game. When you pull along side a biker, a little mini-window appears on either your right or left showing the view out of the appropriate side window of your car. Wait until he’s close enough and going about the same speed and then pop the left or right trigger to blow him away. I really can’t explain why this is so enjoyable. Perhaps it’s a personal thing as the shotgun is my weapon of choice in almost all games that feature it, but Outlander must have been one of the first to let you unload both barrels while driving. This kind of moment is Outlander at its most charming. At its best, it feels like a full game based on the arcade sequences from Full Throttle. Unfortunately, it’s downhill from there. The creators tried gamely to deliver, but there’s just not much fun to be had. Your car handles well and offers a sense of speed, but the driving is boring and repetitive. You’ll fight the same handful of biker sprites and dodge the same road equipment over and over. Added to this is that most of the enemy projectiles are black and grey, meaning they blend in too well with the asphalt and give you an unnecessarily tough time dodging them. Most of the game is spent doing the above. Eventually however, you’ll reach a town. This will be difficult to determine, especially if you haven’t done a little research first, because there is no visual representation of said town. Not even a “Welcome to TOWN” sign which I understand was employed in the Genesis version of the game. Your only tip off is your hazard lights which will flash and beep when you’ve driven far enough. 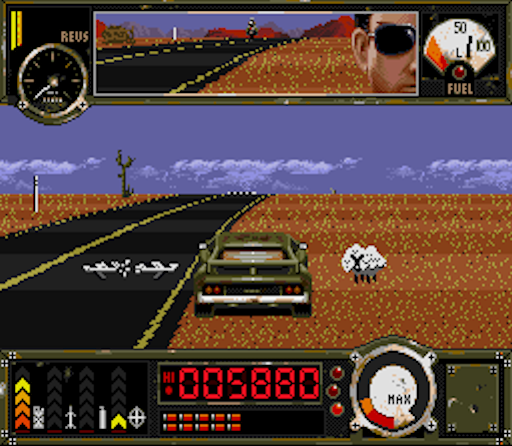 At this point you can pull over and park (you’re strangely safe when you’re not physically on the road) and the game will show you your score for the sequence before sending you to town. And I'm pretty much stuck here forever. The towns are sidescrolling beat-em-up areas that are clearly not as polished as the driving portions. You wander around until a guy in a wifebeater, girl with a shotgun, or punk with a crossbow runs onscreen to throw down. These fights alternate between stupidly easy and inexcusably difficult mostly thanks to the punk. If you’re facing the guy or the girl, you can just crouch and punch. Your reach is much better than theirs and they can’t shoot down so you’re practically invincible. Your only trouble comes from multiple attackers, but a quick dash move can usually place you on one side of the screen so you can take them on separately. The punk, however, is a different story. He reloads his crossbow so fast that you can’t get near him. Ducking is safe, but this makes you immobile, so you better hope you’ve either saved some shotgun shells or enjoy sitting in the dirt for the rest of the game. Fallen enemies, as is videogame law, drop such necessities as food, water, body armor, car armor, and of course the coveted gas can. Eventually, if you make it all the way to the right side of the screen, where your car has inexplicably caught up with you, you may return to the driver’s seat, lather, rinse, and repeat. As I pointed out, this game relies on the films’ concept of limited resources. Start feeling the need for speed and you’ll find your gas tanks empty. Same goes for the weapons. But unlike its predecessor, Outlander doesn’t leave you in the lurch. Pulling to the side of the road at any time and stopping, as if you were entering a town, will take you to a kind of pit stop area. This area looks and plays almost exactly the same no matter where you pull over. It’s a shorter version of a town, except with no buildings and with chain wielding bikers added to the rouges gallery. The bikers are your easiest foe as they are also rendered powerless by your “mighty duck”. However, the first one you see will, unquestionably throw a molotov at you. If you avoid this and the occasional landmine, easily outsmarted by your dash, these pit stops are a cakewalk. Their purpose is to provide you with enemies that drop the gas, health, and bullets you’ll be hurting for between towns. The health will actually be your most sought after pickup, though. Paying no particular attention to my tank, I never ran out of gas. It's not a videogame if you can't crotch-punch a smoky gun-toting redhead. Being able to essentially pause the action and grab some supplies does take a bite out of the difficulty, but the huge chunks of health you’ll lose on the road balance this out reasonably well. There’s also the chance that you’ll lose more than you’ll gain since your car health and body health are one in the same. Taking even more damage than you had on the road in an area that ultimately yields no useful pickups can be quite frustrating. An even lovelier scenario occurs when you finally find that life-giving can of food only to discover that, thanks to the post-apocalyptic radiation, it’s toxic. Later in the game you get a Geiger counter, of all goofy things, to help figure out which items should feature a Mr. Yuck sticker. Running out of health will naturally result in the dreaded game over. If you’re on an emulator, you’ve got save state, but if you’re playing fair you only get a save password every five or six towns. However if you’re an especially slick driver, you can earn continues when the game totals your score before each town. There are little extras to be found here and there, the coolest of which is a speed modification to your car that officially makes it look just like Max’s police interceptor. However, this all adds up to a game with a reasonable amount of potential, but too many holes to seriously enjoy. The driving gets a little more challenging as you progress but it mostly just gets tedious. 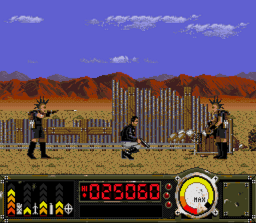 The action levels are woefully unrefined and seem to be thrown in simply because a game where you drive through a flat desert until you go crazy and kill yourself probably wouldn’t have been as marketable. When you’re driving you can’t wait to get to the next town. Then you can’t wait to get back on the road. It does not take long to pick up on this cycle. But each experience does have its moments, at least for a few minutes, and the one thing that never gets old is shooting delinquents off their Harleys with your sawed off little pal. Control is one of this title’s weaker points. Things might be better with a keyboard configured specifically for this game, but on a gamepad Outlander takes some getting used to. In a racing game, your thumb naturally falls to the bottom face button for acceleration, but Outlander maps Y to the gas pedal and reserves B for the machine gun. After having played for several hours, I still instinctively waste bullets when trying to speed up. Brake is awkwardly mapped to X, the topmost button, though to be fair, you rarely need it. The A button is reverse but doesn’t work unless you’ve already come to a full stop with X. For some reason A also shoots your missiles, so good luck with that. The only good thing about the driving controls is that the two triggers fire your shotgun which is both logical and satisfying. In the sidescrolling segments, you naturally rest your thumb across B and Y thinking B will be jump or dash and Y will be punch. In fact B, the most comfortable button, has no use at all that I can tell. Y is dash. A is punch/kick. And X is shotgun. Again, you’ll waste shotgun shells trying to remember what does what at the beginning of each town. 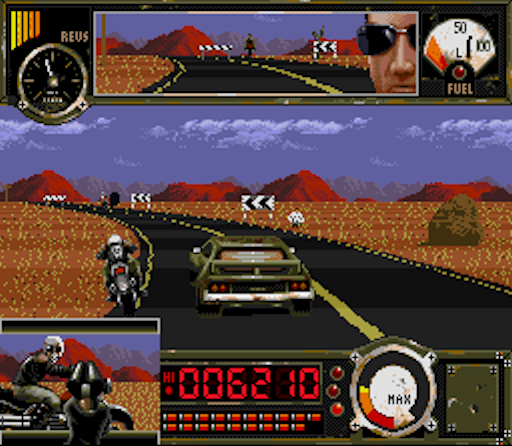 Road graphics are muddy at times as evidenced by the enemies and projectiles blending into the road at long distances. But really, this is expected from a desert-based game on the SNES. Towns fair much better with bright blue skies and that cool three-plane pseudo 3D scrolly effect the SNES did so well. The sound is mediocre. There are only a few tunes but they are appropriate, invocative of Mad Max, and don’t repeat enough to get annoying. The punches, gunfire, and engine roars all sound adequate but not outstanding. It should be noted that there are noticeable differences between the SNES and Genesis versions of Outlander. For example, the Genesis title puts you right behind the wheel of the car as opposed to the third person perspective of the SNES. I’ve also read that the Genesis version is significantly tougher, almost to the point of being unplayable. So if you had Outlander on the Genesis and couldn’t get past the first town, the SNES edition is worth a try. Faithful to Mad Max despite not actually being a Mad Max game, the driving is fun for a while. Repetitive, little reward to keep playing more than a few levels.